Factual error: In a telephone conversation scene between Frank and Handratty, Frank is using a phone that has a plug type receiver. The phones in that era were all hard wired. Factual error: When Frank's mother takes him to the non-private school and he urges his mother not to smoke, in the background, through the car window, you'll see a light-colored Chevrolet Kingswood Estate Wagon driving by, of a 1970 vintage. Factual error: In an early scene where Frank Sr. and Jr. go to the Chase Manhattan bank in New York (1962) a Duane Reade Drug Store with new (1998) store signage is seen in the background. Factual error: In the scene where Frank first meets the candy striper at the nurses' station, you can see a gray Notifier annunciator for the fire alarm system on the wall. These are for a digital system that could not have been around at that time. Factual error: The green-capped McCormick spices on the spice rack in the apartment were not available in the early 1960s. Continuity mistake: When Frank is eating dinner with Amy Adams and her family his napkin is in a different spot in each shot. Continuity mistake: In the scene where Frank is pulling down the second suitcase of money from the top of the bed canopy while talking frantically to Brenda, the large portion of the suitcase is initially on top when the suitcase is put on the bed. But when the camera returns to another shot of the suitcase as Frank is opening it, the large portion of the suitcase is on the bottom. 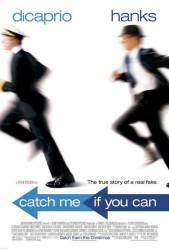 The real Frank Abagnale Jr. was held in the French prison (Perpignan's House of Arrest) for approximately six months. His term was shortened from twelve months. When released (extradited to Sweden), he was ill because he had been forced to live in a damp, dark cell, naked and allowed only bread and water. In Sweden where he was tried and convicted he was kept in a comfortable Swedish prison. However, upon completion of his prison term in Sweden, he was next to be extradited to Italy. The Swedish government believed in prison reform and was afraid of the treatment he would receive in an Italian prison. As a result, Sweden revoked Frank's passport so it could intentionally have him extradited to the U.S. Once in the US, he was protected and couldn't be tried in the foreign countries where he perpetrated his fraudulent schemes. The book about his life contains a more accurate depiction than the film and was written 10 years prior to its release.